Academic study showing a view of a symmetrical pavilion with a dome on a high drum, below which is an apsidal entrance screen of possibly five bays on steps, with aedicular windows on either side and rectangular ones above, and attic storey with figure sculpture. Below this are capricci showing a building with steep drum and dome, portico and projecting wings. At the bottom of the sheet is a detail of two corner bays with Ionic pilasters. 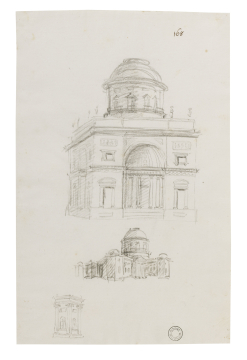 You are here: CollectionsOnline / Academic study showing a view of a symmetrical pavilion with a dome on a high drum, below which is an apsidal entrance screen of possibly five bays on steps, with aedicular windows on either side and rectangular ones above, and attic storey with figure sculpture. Below this are capricci showing a building with steep drum and dome, portico and projecting wings. At the bottom of the sheet is a detail of two corner bays with Ionic pilasters. The smaller perspective is probably related to the scheme in Adam vol.55/164 and the larger pavilion design is part of a series of variations on a symmetrical building with drum and dome, examples of which are found in Adam vol.55/169, 170, 174 and 175. These may all be part of an academic exercise in composition in which Laurent-Benoít Dewez (1731-1812) played a part. There is a more casual, less accomplished version of these schemes in Adam vol.55/51 by Robert Adam.